1. Kelp noodles: These crunchy, clear noodles made from sea algae have the wonderful benefit of being crazy low in calories, gluten-free, fat-free and easy to dose with big flavors, such as a spicy peanut sauce or a simple lemon-and-pepper sauce. While kelp doesn’t have any protein, it is an excellent source of iodine, vitamin K. The noodles come in a bag and are easiest to buy online, but they’re beginning to crop up in local markets. 2. Green tea yogurt: Many people claim that green tea is the healthiest thing you can drink because of its high concentration of catechins—antioxidants that are said to fight and prevent cell damage. Now you can eat your green tea. This January, Chobani is launching their newest limited-batch flavor: green tea Greek-style yogurt. Green tea and dairy actually go well together (no surprise to anyone who has had green tea ice cream). One container has 140 calories and is made with 2 percent milk fat yogurt. Look for it in most major markets—or, if you’re in New York, at their yogurt bar in SoHo. 3. Savi seeds: The savi seed isn’t a nut, but it tastes like one, which means it’s perfect for anyone with a nut allergy. These seeds grow from star-shaped pods and are native to the Amazon rain forest, where they’ve been consumed for centuries. One ounce of savi seeds delivers 9 grams of plant-based protein, 5 grams of dietary fiber and 6 grams of omega-3, which is more than you’ll get from salmon or fish oil supplements. 4. Cricket anything (flour, powder, bars): Some call this the gateway bug because with the various ways they are processed, they are the insects that are the least likely to make you recoil. These cute creatures are typically roasted and then ground up, making for an excellent source of protein and fiber. They also provide more iron than beef, but unlike beef, they’re low in cholesterol and saturated fats. The bugs come in all kinds of diet-friendly concoctions: flour and cookies from Bitty Foods, powder from All Things Bugs, protein bars from Exo and Chapul and chips from Six Foods. 5. Oysters: No. 5 on our list should bring cheers all around, if only for the sheer number of oyster-based happy hours cropping up. 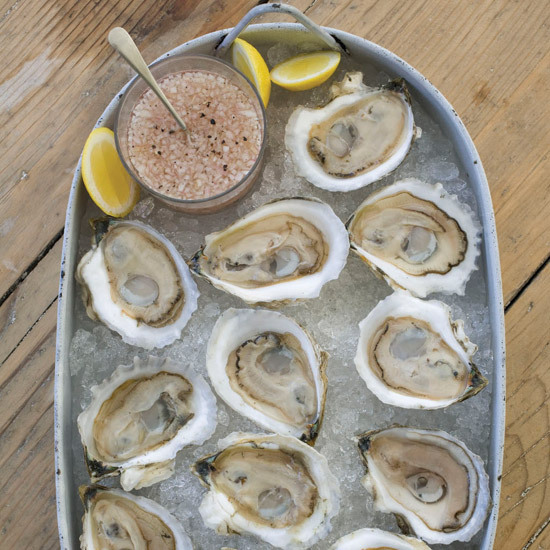 As long you limit your alcohol, you’ll find oysters to be a super healthy appetizer or snack. Six medium raw oysters range from 43 to 58 total calories, and these delicacies are high in both zinc and omega-3. The best news? January is an exceptional month to be eating these guys because, like the rest of us, they’ve been putting on weight to keep warm in the winter. 6. Wood ear mushrooms: This common Asian ingredient is also called tree ear mushroom. In Chinese medicine, these are said to improve breathing, circulation and well-being. The ear-shaped cap is stemless and dark brown to black in color, and you can find them dried, like you would shiitake mushrooms. The beauty of wood wear mushrooms—and others like them—is that they’re a perfect way to add texture to any dish without unwanted calories. We can get behind anything that ups our well-being and not our weight.